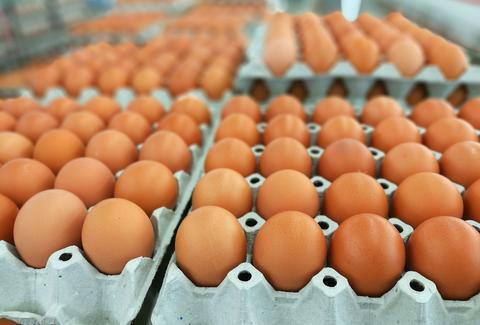 A salmonella outbreak that prompted a massive recall in April of more than 206 million eggs produced by a North Carolina farm has now sickened at least a dozen more people in five states. That brings the number of people who've fallen ill from the tainted eggs to 35, 11 of whom have been hospitalized, according to a new report issued by the Centers for Disease Control and Prevention (CDC). The outbreak, which started getting people sick as far back as March 5, was traced to a single facility in Hyde County, North Carolina owned by Indiana-based Rose Acre Farms, the second largest supplier of eggs in the country. The series of illness reports linked to the outbreak triggered what has since become the largest egg recall since 2010. Fortunately, no deaths have been reported, but the fact that people are still getting sick is somewhat alarming. The affected eggs were sold under a number of different brand names and at major chain stores like Walmart and Food Lion. They were also sold to a number of restaurants, including Waffle House. Evidently, many of the eggs were labeled with "Best By" dates of April 1 or April 2, according to the CDC's report. In total, nine states have reported cases of the salmonella strain linked to the outbreak, including Colorado, Florida, New Jersey, New York, North Carolina, Pennsylvania, South Carolina, Virginia, and West Virginia. New York and Virginia have been hardest hit, having reported eight cases each. If you're not sure whether or not you have a recalled carton of eggs sitting in the back of your fridge that should get tossed, the CDC has a helpful list of all the brands associated with possibly contaminated packages. Following the recent spate of illnesses caused by E. coli-tainted romaine lettuce, this marks the second big food-borne illness outbreak to hit the country this season. Fingers crossed things calm down for the summer.